SANTA MONICA, Calif.–(BUSINESS WIRE)–SonoSim, Inc. today announced that it has entered into an agreement with GE Healthcare, a leading provider of ultrasound technology globally. This collaboration will help accelerate the adoption of bedside ultrasound by medical practitioners by eliminating a historical barrier to its use, and provide an effective training solution to the difficult and complex nature of ultrasound education. 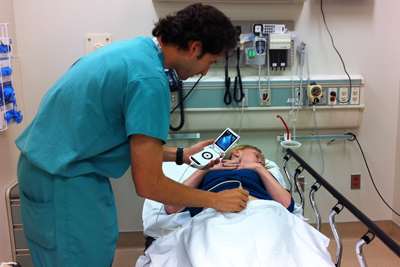 The SonoSim Ultrasound Training Solution is a portable, virtual ultrasound training experience, utilizing real patient cases with a broad spectrum of normal and pathologic conditions. The SonoSim® 365 for GE Healthcare provides convenient ultrasound education through integrated didactic instruction, hands-on training, and knowledge assessment.